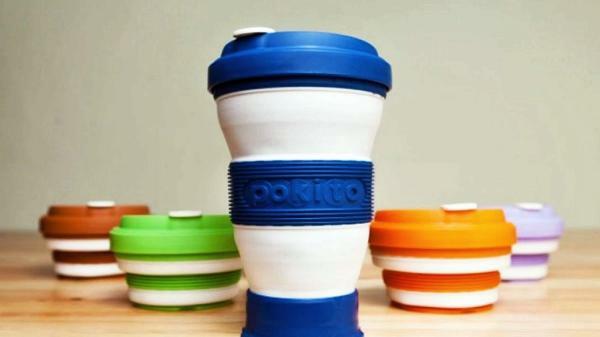 LONDON – Pokito is a collaspible, reusable coffee cup designed and manufactured in Engalnd, which its inventors hopes will solve the paper cup mountain (PICTURE). It’s all very well Hugh Fearnley-Whittingstall telling people they should avoid disposable coffee cups, but has he ever tried putting a ceramic mug, complete with dregs, in his suit pocket? Now, amid calls for a 5p tax on paper cups, one inventor believes that he has a replacement for them: a reusable, sealable and collapsible container. Andrew Brooks, a British businessman, became interested in the idea after a trip to Canada when he saw hillsides denuded of trees that had been cut to make disposable cups to sustain the Pacific coast’s coffee culture.